Applications that can be characterized as industrial fluid handling or process control are vast in number and variety, each being highly specialized and customized to specific circumstances. It’s no surprise that, given the array of potential application conditions, there are countless different valve arrangements, types, and technologies to choose from. 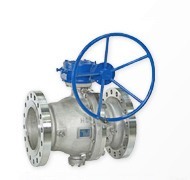 Ball valves, like many valve types, are named for their closure mechanism. A spherical shaped element is placed in the fluid flow path, with the ability to rotate its position around an axis. The axis is a shaft or other device that connects to an actuator on the exterior of the valve and flow path. The actuator can be a simple handle or an element of a valve automation system. The “ball” in the ball valve has an opening through its center, usually round to mimic the shape of the connected pipe. As the ball is rotated, the opening aligns with the inlet an outlet of the valve body, allowing fluid to pass. A counter-rotation that aligns the opening with the sides of the valve body, away from the flow path, stops the fluid flow. So, compared with other valve technologies, when would a ball valve be a preferred application choice? Here are some points to consider. Well suited for processes requiring only full flow or no flow operation. Rapid open and close action, requiring only 90 degrees of rotation from fully open to fully closed. Comparatively light weight and small size. Wide range of construction material options for body, ball, and seals make them suitable for many applications. Require only moderate force to control valve position. Flow path opening in the ball will often be “full port”, providing same cross section as the connected pipe and adding very little restriction or pressure drop to the flow. Low maintenance, with no lubrication required. What considerations might be cause to consider a different valve type? There can be some residual fluid trapped in the valve when it closes.The trapped fluid will be released when the valve is opened. Consider what impact, if any, this may have on your process. Balls valves are generally not suited for throttling applications. When partially open, the seals that surround the ball are exposed to the flow velocity and can deteriorate quickly. Valve seals are usually elastomeric materials. Verify seal materials are compatible with the fluid type, character and operating temperature. These comments are general in nature and there are some specialized ball valve designs that have overcome some of the general disadvantages noted here. Have a conversation with a valve specialist about your application and benefit from their experience and knowledge.